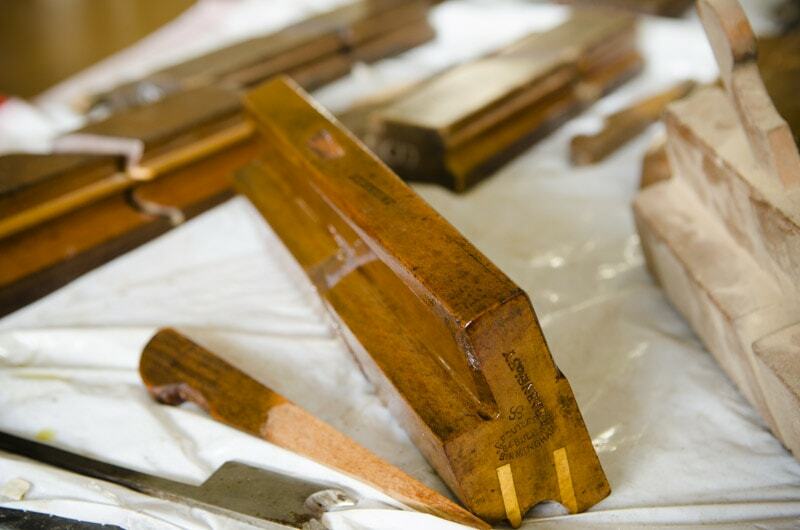 In my above video I show how I clean and oil my antique molding planes. 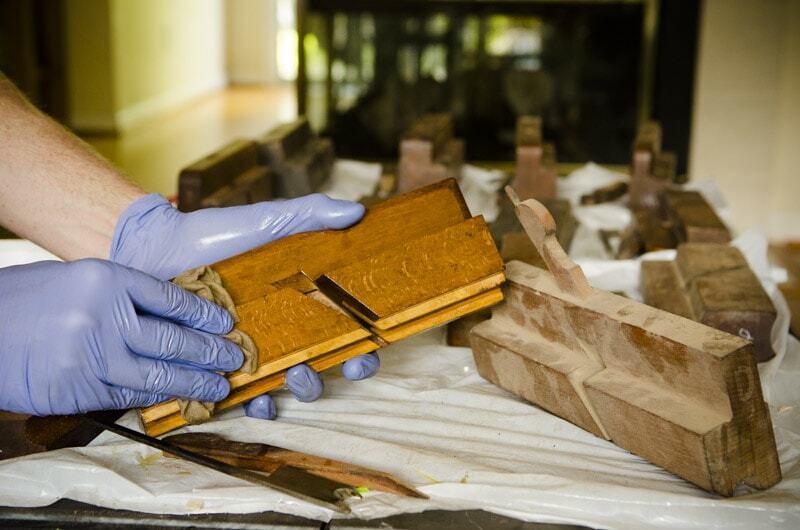 Of course, this method can apply to any wooden hand planes. 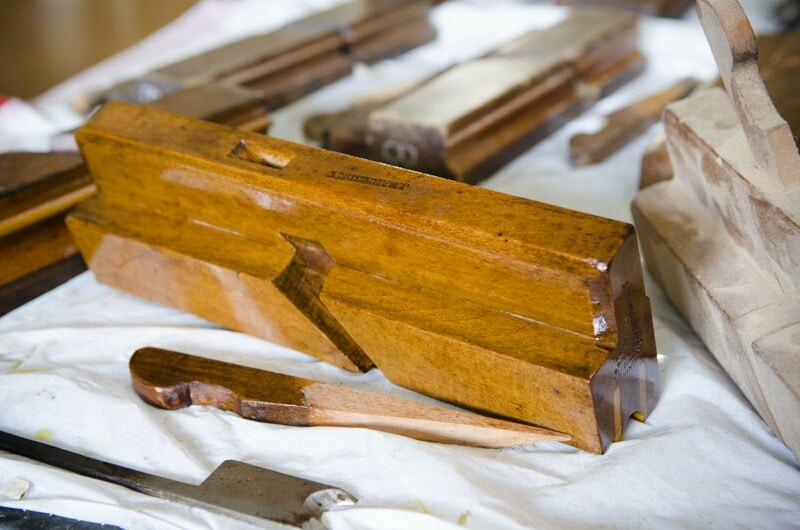 My friend was kind enough to give me about 65 antique molding planes (thanks Bill!). Instead of spending a ton of time refurbishing them all right now, I thought I’d simply clean and oil them, and refurbish a plane when needed. I like to use boiled linseed oil (if you can’t find it at a local hardware store, you can buy some here). Yes, BLO takes awhile to dry completely (1-3 days), but it’s not a big deal since these planes will sit on my shelves for a few weeks before I use one anyway. 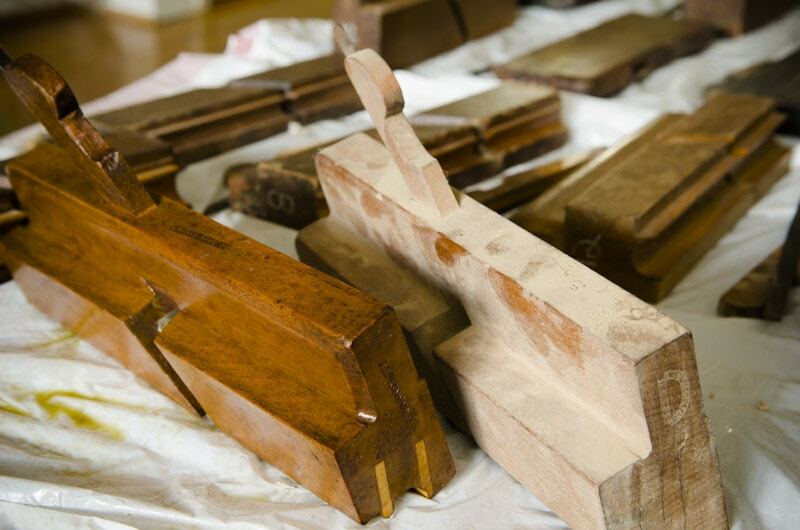 And yes, boiled linseed oil can darken over time. 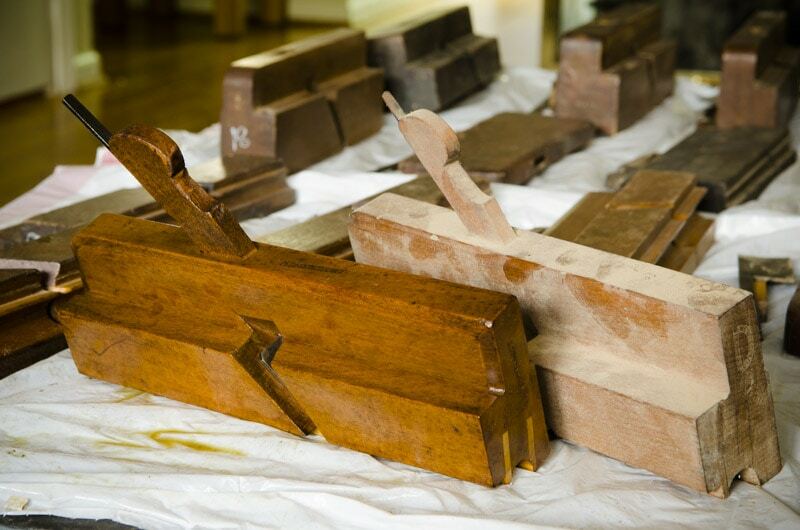 But I actually love the historic look of darker molding planes. After oiling the molding plane body I oiled the top of the wedge, where the previous owner’s oiling job stopped. I also rubbed mineral oil on the molding plane iron (blade). Now doesn’t that look beautiful? Yes. The answer is yes. 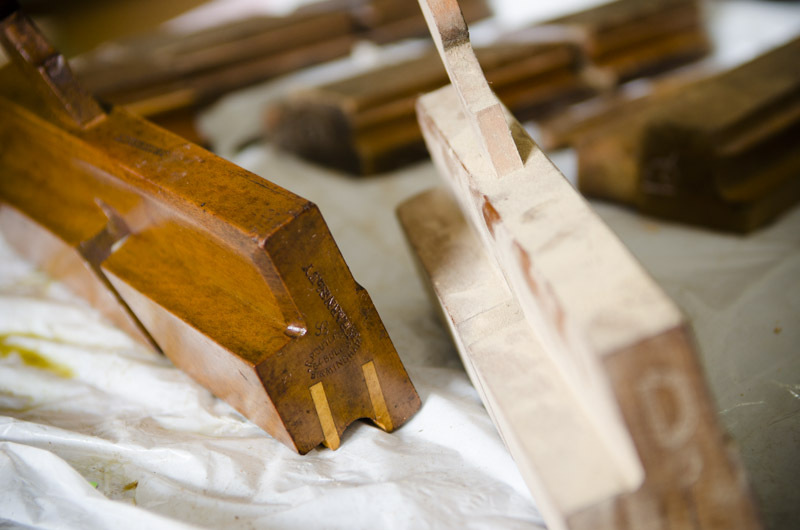 And now compare it with a dusty old molding plane: Ahhh, such satisfaction… After 10-20 minutes make sure you wipe the surface with a dry cloth or paper towel to remove excess BLO and to buff the finish a tad. 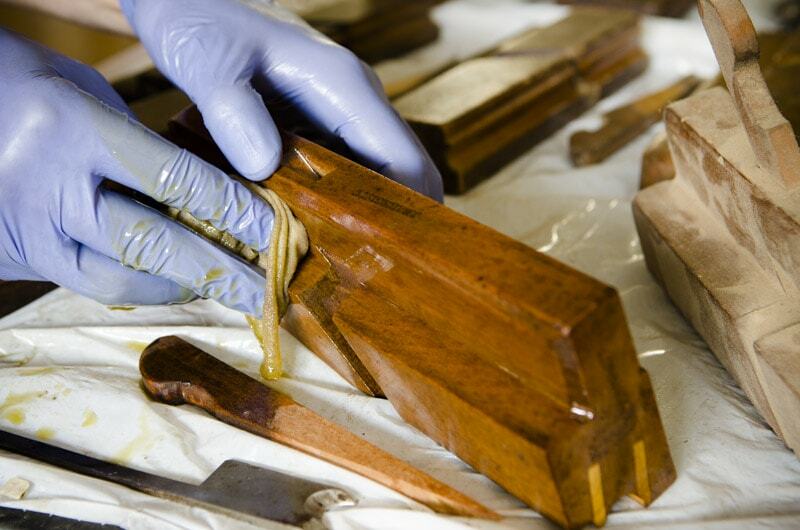 ***Warning: if you decide to add wax to any wooden plane, make sure you keep the wax out of the insides of the plane. Wax will prevent the wedge from sitting tight. Just think suntan lotion. Keep it on your skin and out of your mouth and any other orifice! 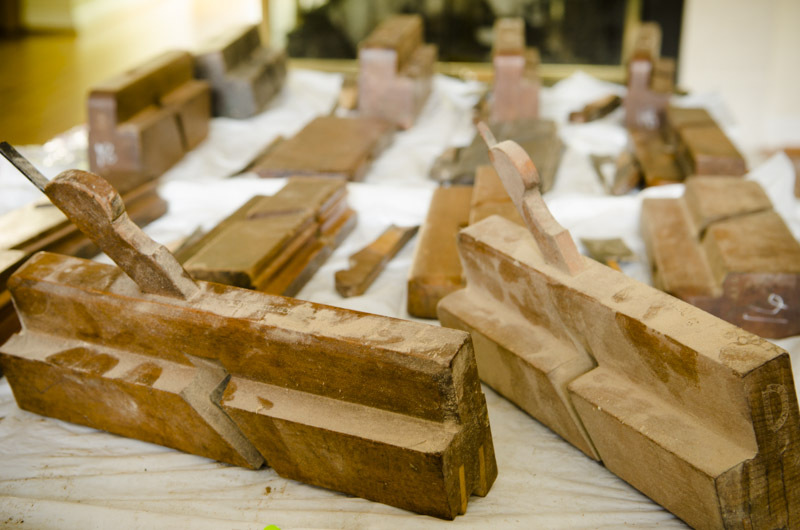 Hello Graham, and welcome to a place that will rekindle your old hobby! I’m not sure about that mixture being a cleaning solution, but I use a boiled linseed oil / turpentine / beeswax mixture for furniture wax. Is that what you remember?